Established in 1969, Butlers is renowned for their professionalism, as well as been leaders in wedding decor we now offer chauffeur-driven wedding car service. 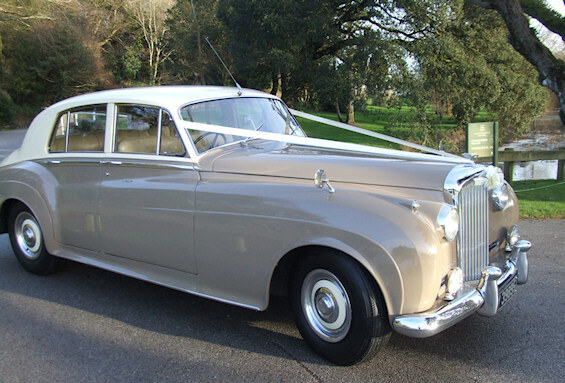 Our Ivory Colour Bentley S1 is a rear vehicle that guarantees to turn heads on your special day. It is one of 700 cars built that year and is rear as these cars are exported and collected all over the world. The cars first owner was in Switzerland in 1955 and was specially commissioned for the original owner. It has been kept in showroom condition from the day it was purchased and is regarded as the most prestigious Wedding Cars of all time. From the moment you speak to us, you'll know you are in the safe hands of experienced professionals. Your Wedding car and uniformed chauffeur will play an important role on your wedding day. When you book with us you can be assured of individuality reflecting only the very highest standards of quality and service. We hope you find the information on this site useful, should you require anything further please contact us anytime 7 days a week. Our illustrations endeavour to show correct colour, condition and size of the vehicle, although we still recommend viewing as they tend to be larger and more accommodating in the rear than may be apparent. As stated our Ivory Bentley is a rear and exceptional vehicle and it is advisable to book as early as possible to avoid disappointment. For civil ceremony weddings where the ceremony and reception are at the same venue the vehicle will stay whilst the ceremony takes place and then, immediately after this, take the bride and groom for a short drive, before returning for their photographs and reception. Our chauffeurs wear traditional uniform and all are proud of their attention to detail on your wedding day. Our vehicles complement the bride, they are not the 'star' and travelling in them should be an enjoyment of a more serene and less rushed world. So indulge yourself and make that call and let us at Butlers look after your needs, from chauffeur driven cars to wedding invitations, chair covers, backdrops, candelabra hire, we have it all, just give us a call! Based in Dungarvan, Co. Waterford we are Ireland's Leading Wedding Accessories Shop!